SCCZ looks forward to nurturing a familial relationship with all the Claretines who pass through its portals. 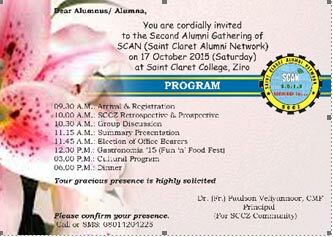 To this end, SCCZ has established SCAN = Saint Claret Alumni Network. Every Claretine who graduates from SCCZ is to register as a member of SCAN, and the College keeps in touch with them. Occasional SCCZ family reunions and get-togethers are held. The alumni application form can be downloaded here. The Second Alumni Meet (SCAN 2.0) is held on Saturday, October 17, 2015. All graduates are invited to the same. On the day, the Claretine Rank holders of the 2015 RGU examinations will be honored and inducted into the SCCZ Hall of Fame.